What happens to all your social content when you die? Do you ever think about your private information falling into the wrong hands? Perhaps this is why I never kept a journal online or offline, knowing someone might have the pleasure of finding dirt that is sacred to me. Today we have email, electronic calendars, and myriads of documents for work and play all filed away in Google Drive. Will anyone in the future have access to them, locked away behind our passwords? Now I’m thinking what part of my after-life reputation I want protected from the public when I die. I don’t care about parting ways with my +1's. I’m thinking I should be able to leave someone the books, music and apps I purchased rather than fretting if my Gmail or drive folder is accessed by some fruit loop. Lawyers, scholars and the government have been urging us to prepare to protect our post mortem reputation (our content). Write a social-media will, they plead, some sort of detailed plan for how your online life should be handled after you croak. The will is a great idea except for one thing. What if you list all your social media information and passwords in the will and a month before you die you update a password and forget to revise your will? If the social media information in that account is not accessible by the appointed “trusted contacts” because of a wrong password, that information then becomes public information. If you’re like me, I have many passwords and will change them frequently, making it cumbersome to maintain a social media will. You’d think Google Death would make his wife's life easier by managing his digital accounts for her so she can focus on the other details of handling his death. I’d be less concerned with my Facebook account living forever, and more concerned with the wrong person accessing my private email or Google drive information and plastering it all over the internet. Sure I’m dead and would care less about my reputation, however, my loved ones might not like what they find on the net from an adversary who only wants to damage my family’s reputation and cause harm. Alternatively, you can set up the manager to outright delete your account without sharing it at all. This includes all data associated with the account -- Blogger posts, uploaded YouTube videos, Picasa albums, Google Voice messages, etc. (Note to self – this is for only your Google world content, not Facebook or other social hubs). I always say, “if you don’t have plan B, you don’t have a plan.” Google Death is a splendid plan B when it’s time to say Ta-Ta Toots. Now you can execute your plans without you once you're gone – in a graceful way, requiring few decisions on your part. So fill out that quick form and wait for the next service from Google. I’ll really be impressed when Google finds a way to post from the grave. (Most Up To Date) Important, Powerful & Relevant Statistics That Will Empower You To Sell More Cars! Why Didn't Customers Buy From You? In today's world of the Internet, smart phones, and apps for everything, communication is supposed to be easier and more efficient than ever before. But when it comes to dealers communicating with potential customers, plenty of opportunities are still slipping through the cracks. 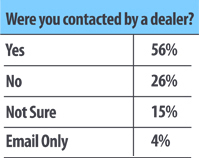 That's one of the major takeaways from our latest exclusive quarterly survey of customers who submitted leads on CarsDirect.com. Looking at the first chart a full 41% of consumers said they either weren't contacted by a dealer or were not sure if they were contacted. In today's world, there's almost always a way to reach a potential customer, but almost half of leads are passing by unconverted due to something as simple as making initial contact with the customer. Moving onto the second chart, again we see that by far the top reason or not purchasing: no contact. If there's no communication with customers, it's impossible to make sales. That's why it's imperative to examine and refine your processes so your sales team knows they did everything they could to contact a customer and get them in the door. 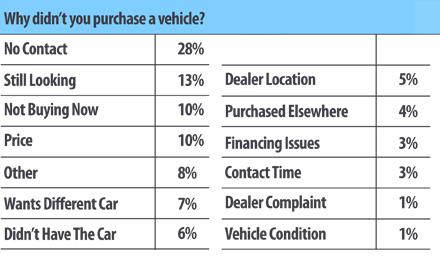 The second most-cited reason customers gave for not purchasing was that they are still looking for a vehicle. These are the cases when contact is made with a customer but they drop off the radar. In these cases, it's important to examine why your team hasn't closed the customer. Are they still working the customer? There's usually plenty of opportunity to win a customer back if they're undecided. Finally, the third most common reason that customers gave for not purchasing was price. Here, make sure that you're giving customers a price online so that there is no surprise about price on first contact. Also, make sure you're priced competitively in your area. It sounds simple, but your prices could be out of line with the rest of your local market if you're not keeping tabs on pricing trends in the surrounding area.